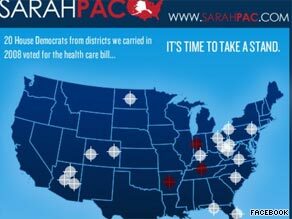 An image on Sarah Palin's Facebook page featuring crosshairs on certain Democratic districts is causing an uproar . Washington (CNN) - Sarah Palin's team is fighting back against some Democratic claims that the former Alaska governor is encouraging threats of violence against members of Congress who voted in favor of health care reform. Democratic officials and liberal Web sites are upset that Palin used an image of crosshairs in a Facebook post this week listing 20 vulnerable Democrats who voted for the legislation. She plans to target them this election year with money from her political action committee. One House member mentioned the Facebook posting during a Wednesday meeting on safety concerns, a Democratic source told CNN's Dana Bash. Mention of the map brought audible groans to the room, the source said. Democratic National Committee chairman Tim Kaine released a sharply-worded statement Wednesday night accusing several Republican leaders, including Palin, of inciting dangerous behavior. "Republican leaders are themselves engaging in actions and rhetoric that previously would have been limited to fringe elements of the Republican Party," Kaine said. "Sarah Palin has invoked health care 'death panels' and has now placed gun sights on 20 Members of Congress who supported reform." An adviser to Palin responded by pointing to several instances in which the former Alaska governor has urged supporters to focus their energies on civil debate and action at the ballot box - not extremist activities. "We are now the keepers of an honorable tradition of conservative values and good works," Palin said at the national Tea Party Convention in Nashville last month. "We must never forget that it is a sacred trust to carry these ideas forward. It demands civility and it requires decent, constructive, issue-oriented debate." The adviser also noted that Palin spoke out last year after the murder of abortion provider George Tiller in Kansas, writing on her PAC Web site that "violence is never an answer in advancing the pro-life message." "Its good that she finally agrees with the Democrats on something," the adviser told CNN. "[House Majority Whip] Jim Clyburn said that silence equals consent, and in this matter she agrees, which is why she has been vocal about condemning violence." Sen. John McCain, who tapped Palin as his running mate during his 2008 presidential bid, defended Palin's Facebook posting on NBC's "Today Show" Thursday. "I have seen the rhetoric of targeted districts as long as I've been in politics, please," McCain said. "Any threat of violence is terrible but to say there that there is a targeted district or that we reload or go back into the fight again, please, those are fine, they are used all the time." the truth hurts – she is drumming up violence to dems. anyways... why is this stupid woman making any headlines at all? John McCain said, "Any threat of violence is terrible but to say there that ...... ". There is no "BUT ...."
Commentators on TV let the GOP get away with these fake "equivalency" statements .... kind of like off seting penalty flags in football ... that is useless and doesn't improve anything. Have some balls and call the penalty on the side that committed the wrong when they are found out. PERIOD. What the transgressors hear is the part after the "but ...." thinking they have been sanctioned to continue their behavior. If any GOP'er were serious, they'd drop the "but".... They would make a definative statement saying they will support the prosecution of anyone threatening violence. Coming from an inarticulate, incoherent, intellectually challenged, rural, self-promoting, religious zealot that has been riding the coat tails of her party's post election defeat, why would anyone pay any attention to this vacuous and purile woman. She does nothing more than polarize the American public, while making millions of dollars. Her followers must be sheep. they are the ROOT OF THE PROBLEM, they promote racism and hate, and violence, VOTE THEM OUT, and somebody needs to follow palin's advice and do it to her as she request. Demobrats are whining about this? I really wish all the yahoos in Washington and in the political discussion would just use some common sense. Oh, and maybe do their job at the same time and get something done! I find Sarah Palin to be physically irresistable and intellectually replusive. Under modern election standards, that should land her in the White House in 2012. What she did is unpatriotic and an American!!! Encouraging terrorism is not how a democracy works!!! This is what bothers me about the republican politicians reacting to this. They say one thing and then totally deny that they are encouraging dangerous behaviour. Not good at all. Palin in my book is an extremist. Evident in the General campain. Sarah Palin incites Racial Prejudice,Hate,lies,corruptness,wild-life hunting and killings,abusiveness,quitting jobs. Interesting, because none of us have any memory of her being vocal in opposition to violence. To the contrary, she's been whipping her "troops" into a frenzy since the moment she was names as Grampy's sidekick. This website with shotgun targets is a perfect example. Way to promote violence Ms. Pro-Life Palin! Palin can't have it both ways with this deplorable nonsense, inciting violence again with reload (ad nauseum) and sights on certain areas. The FBI should pursue this irresponsible behavior from Palin and shameless others before someone gets hurt. Enough! Prime example of a nut leading nuts!! Sarah Palin is an idiot and John McCain is an enabler. Her rhetoric is explosive and even though I don't think she is very bright, she is smart enough to know that her language incites anger. And this anger has gone too far. Vulgar language and spitting are beyond the pale. How would she like it if people screamed "white trash" to her face? Or if someone called her home leaving threats so that her children could hear them? Or how would she like it if her children were threatened? THIS NEEDS TO STOP NOW!!!!!! The Republicans are sore losers. They know nothing of civility. Character isn't shown when one wins, but when one loses. And the Republicans have shown that they lack any modicum of character. Sure, "Reload" is a clear call for non-violent resistance.